Using the variational method, Chenciner and Montgomery (2000 Ann. Math. 152 881–901) proved the existence of an eight-shaped orbit of the planar three-body problem with equal masses. Since then a number of solutions to the N-body problem have been discovered. On the other hand, symbolic dynamics is one of the most useful methods for understanding chaotic dynamics. The Sitnikov problem is a special case of the three-body problem. 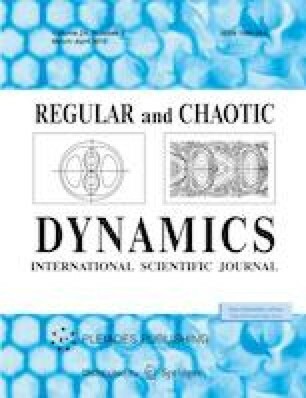 The system is known to be chaotic and was studied by using symbolic dynamics (J. Moser, Stable and random motions in dynamical systems, Princeton University Press, 1973). In this paper, we study the limiting case of the Sitnikov problem. By using the variational method, we show the existence of various kinds of solutions in the planar Sitnikov problem. For a given symbolic sequence, we show the existence of orbits realizing it. We also prove the existence of periodic orbits.